click on the above link to see report. Click on the link above to see report. Carbery now meet Castlehaven in a mouth watering semi-final. 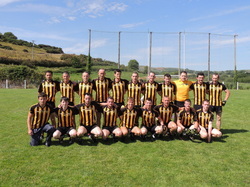 Kilbrittain met Bandon in the quarter-final of the Buckley Financial Junior A football championship in Barryroe. Kilbrittain went into the game on the back of a fine win over Muintir Bhaire in the previous round, and after a good league campaign that sees them sit at the top of section 3. Alas the good form shown all year deserted Kilbrittain just when they needed it most. Bandon opened the scoring inside the 2nd minute with a point. Kilbrittain had already registered a wide at this stage from a goal bound shot, but Chris Hickey pointed in the 4th minute with a low shot that could just have well been a goal. Declan Harrington pointed a minute later, again, a possible goal was for the taking but little did Kilbrittain know at this stage how vital those goal chances would have been as the game went on. Bandon levelled matters in the 7th minute and regained the lead with a free 4 minutes later. That was the 13th minute and how unlucky that proved for Kilbrittain as this was a lead that Bandon were not going to surrender and following a soft '45 which was pointed in the 19th minute, Bandon went on to outscore Kilbrittain by six points to one from there to the break. A pointed free in the 20th minute, and points in the 22nd, 24th, two, 26th and 29th minutes opened up a lead that made Kilbrittains second half a mountain to climb. Noel Griffen pointed a free in injury time of the first half to give Kilbrittain a glimmer of hope and the halftime score read Kilbrittain 0-3 Bandon 0-10. While Kilbrittain didn't have any 'bad' player on show, on the day Bandon were far superior and would have beaten most teams with that polished performance. Disappointment for Kilbrittain who must now wait for a league final. 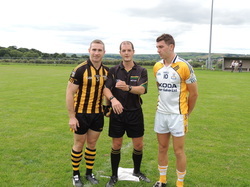 Team: Seamus O'Brien, Cal McCarthy, Owen Sexton, Sean McCarthy, John Kearney, Vincent O'Brien, Darren Hickey, Maurice Sexton, Ross Cashman, Jamie Wall 0-1, Chris Hickey 0-1, Cian O'Leary, Declan Harrington 0-2, Noel Griffen 0-1 free, Pat O'Mahony 0-1 free. Carbery continue their progress through the Senior Football championship with a fourth round victory over Ballincollig in Clouduv. This victory qualify Carbery for the quarter final of the championship and it was expected over a much depleted Ballincollig side. Carbery took the lead in the 3rd minute with a Tadgh Downey point which was negated immediately by a john Paul Murphy point for Ballincollig. Declan Barron and Brian O'Driscoll added points for Carbery before Ballincollig won a penalty through Patrick Kelly. John Kelly stepped up but his initial shot was parried by pat Prendergast who was alert to foil the rebound shot also. This failure to goal prompted Carbery to attack up the field and Kevin Harrington pointed Carbery's fourth point. Carbery then hit a purple patch with four points in as many minutes to lead 0-8 to 0-1. Ballincollig kept in touch with points from George Durrant and John Miskella and were only three points in arrears at halftime. Alan O'Connor was a powerful influence at midfield for Carbery and Ballincollig moved Patrick Kelly to midfield early in the second half. They introduced minor Cian Dorgan into their attack and he immediately pointed to put two between the sides. The same player soon afterwards had to leave the field with a leg injury. In the 40th minute Allan O'Connor forced his way upfield and delivered a high ball which seemed off target but he was the next player to handle the ball and made an opening for Declan Barron to find a way to bury the ball to the Ballincollig net. Leading 1-11 to 0-8 entering the final quarter Carbery introduced Stephen O'Mahony at full forward where he had maximum effect scoring 1-3 to put the game out of reach for Ballincollig. Team: P Prendergast, P Murphy, O Sexton, K Harrington 0-1, B O'Driscoll 0-2, J O'Donovan, G Canty, A O'Connor 0-1, R Deane, T Downey 0-2, D Barron 1-3, M Sugrue 0-2, J Wall 0-1, P Kirby, Subs used: C O'Driscoll 0-2, S O'Mahony 1-3, P Nolan, K O'Sullivan, G Hurley. Team : Seamus O'Brien, Cal McCarthy, Owen Sexton, Sean McCarthy, Chris Hickey, Darren Hickey, John Kearney, Maurice Sexton, Ross Cashman 0-1, Cian O'Leary 0-2, Tom Harrington 0-1, David Desmond 0-1, Pat O'Mahony 0-2, 0-1 free, Noel Griffen 1-3 Declan Harrington 0-1. Subs used: Ivan Burke, Jamie Wall 0-1, John Murphy, David Hayes. Kilbrittain in the eight minute. Kilbrittain were playing against the gale of wind and found themselves under constant pressure. The Kilbrittain defence were in mean mood however and by the tenth minute had leveled the game via a Declan Harrington point. A long delivery for the Haven on the quarter hour mark, decieved Kilbrittain goalie Seamus O'Brien and ended up in the net for a fortuitous goal. Kilbrittain responded with a pointed free from impressive Noel Griffen and a lovely David Desmond point. Castlehaven added a point before Declan Harrington pointed following a great pass by Vincent O'Brien. The halftime score read Kilbittain 0-5 Castlehaven 1-3 and Kilbrittain were in a good position after playing into the strong wind. Again the Haven opened the scoring in the second half with a point within a minute but this was to be their last score for thirty minutes as Kilbrittain powered into the second half with scores from Pat O'Mahony, one, and Noel Griffen, two, to lead at the three quarter stage. Substitute Chris Hickey pointed twice in as many minutes to extend the lead before a '45 deliverd by Jamie Wall was broken by Griffen to the path of O'Mahony who delivered the killer blow with a fine goal. Kilbrittain were now six points to the good with eight minutes remaining, and with Castlehaven failing to get to grips with the wind, Kilbrittain finished strongly with points from Griffen from a free and Maurice Sexton before Castlehaven had the final say with a point in injury time. Final score Kilbrittain 1-12 Castlehaven 1-5. This was a good win for Kilbrittain after making hard work of the same game the previous year. The wind was a factor, however Kilbrittain coped better in the first half when it seemed to be at its strongest. Team: S O'Brien, C Moloney, O Sexton, C McCarthy, D Hickey, V O'Brien, J Wall, R Cashman, M Sexton 0-1, C O'Leary, T Harrignton, D Desmond 0-1, P O'Manony 1-2, (0-1free), N Griffen 0-4, (0-4 frees), D Harrington 0-2. Subs used: J Kearney, C Hickey 0-2.
break. Gabrials were quick with their response with two more points before a long delivery by hard working Conor Moloney found Wall who offloaded to Denis Whelton who stuck the ball in the Gabrials net. Ivan Burke put Kilbrittain back in front with time almost up but there was enough time for Gabrials to equalise with a point as the last kick of the half. 1-06 a piece at halftime was a fair reflection of the half with no side dominating for long periods. The second half proved to be a different game as Gabrials came out of the blocks all guns firing. A point after 30 seconds signalled their intent as two more in the third minute extended their lead. Jamie Wall pointed in the seventh minute which was to be Kilbrittains last score for almost twenty minutes. Kilbrittain failed to clear a poor delivery which led to Gabrials second goal in the tenth minute. O'Donovan, James Hurley, Chris Hickey, Conor Moloney 0-1, Jamie Wall 0-3, Ivan Burke 0-2,(0-1 free), Ross Moynihan, Declan Harrington 0-1, Denis Whelton 1-0, Ryan Crowley 0-1, Subs used, Kevin O'Neill.